If you use your vehicle for off-road driving, you should wash it after each offroad trip. Pay special attention to the removal of any accumulation of salt, dirt, mud, and other foreign materials. Ensure drain holes in the lower edges of the doors and rocker panels are kept clean. Insects, tar, tree sap, bird droppings, industrial pollution and similar deposits can damage your vehicle’s finish if not removed immediately. When using the High Pressure car wash system for cleaning the exterior of your vehicle, be aware that without following the proper precautions, it may damage your car. Never let the high pressure car wash nozzle come too close to the windows, soft materials, light system (headlights, taillights and such), camera, sensors, bumpers, rubber (including tires), and also the underside of the vehicle. The high pressure could damage these parts especially if injected from a short distance. Never clean a specific point on the vehicle for a prolonged time. 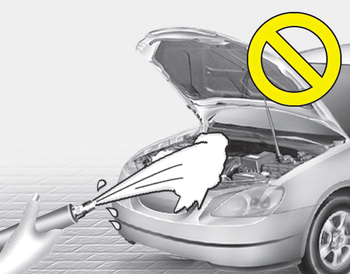 Applying the high pressure car wash nozzle for a prolonged time it could damage and harm the vehicle. Even while the high pressure car wash nozzle is applied from a distance for a limited time only, always bear in mind that a direct stream would greatly affect the surface of the vehicle.